Are you an avid cook or do you have kitchen nightmares? Even if you think cooking is too daunting because of a lack of time or skill, anyone can learn to master a few recipes. The quintessential Italian-American classic has been a staple of dinner tables since 4 million Italians immigrated to the United States between 1880 and 1920. These poor, mostly Southern Italian immigrants weren’t able to afford higher-quality cuts of beef like filet mignon, so the meatball was the perfect solution to take advantage of the meat available to them. This Spaghetti and Meatballs recipe from epicurious.com describes itself as the ultimate recipe with a “super tender and robust meat mixture, slow-simmered and flavorful sauce, and tons of cheese.” That’s music to our taste buds! Or even for carnivores who are open-minded! This Italian Meatballs Recipe from The Vegan 8 is not only super quick to make but it’s also a tasty meat-free version of your favorite Italian dish, plus it’s cholesterol-free! Made with chickpeas and couscous, these meatballs are ready to be devoured in just one hour. There’s nothing quite like a hearty plate of spaghetti and meatballs. This rich, creamy staple of American cuisine traces its history to Thomas Jefferson, believe it or not. The Founding Father and third U.S. president encountered macaroni in his travels to Italy and imported both macaroni and Parmesan cheese to satisfy his cravings for the dish. Eventually, mac and cheese become popular among the “lower classes” and has been a rib-sticking comfort food for millions of American households for nearly 200 years. This Mac and Cheese recipe, with optional Bacon and Jalapeños by I’m Bored, Let’s Go will have your Mac and Cheese craving fixed fast. The best part? You probably have most of these ingredients ready and waiting in your kitchen. From toddlers and teens to grownups, everybody loves mac and cheese. If this recipe doesn’t have you running for the kitchen we don’t know what will. These Fried Mac and Cheese Bites by the Little Southern Chef look divine, if a little naughty. But these would be perfect for parties, or simply all to yourself – we won’t judge! With cheese or without, the original “hamburger” started appearing around the U.S. near the turn of the 20th century. Burgers have been the American staple food ever since. From ballparks to fine dining establishments, Americans’ appetite for burgers is probably encoded in our DNA. Check out these recipes that rival the culinary creations of your favorite local burger joint. This monumentally tasty Cheddar-Stuffed Burgers with Pickled Slaw and Fried Shallots recipe from Food and Wine belongs on the Mount Rushmore of burgers. The divine ingredients and straightforward recipe will make this a favorite in your recipe bookmarks for a long time. If you’re not a vegetarian, you might be a little scared of trying a veggie or vegan burger. Don’t be — this recipe for grillable veggie burgers packs a ton of spice and flavor into its base of black beans, walnuts and brown rice. Plus, this recipe also comes with a pretty great dressing mix, and directions for the perfect accompanying fries – winning! Nothing says American cuisine like juicy, old-fashioned burger. Originally called a “Yankee pot roast,” this savory combination of tender beef, seasoned vegetables, and rich sauce was originally a New England winter staple. New Englanders found that slow cooking tougher cuts of meat in liquid — a process known as braising — produces tender meat and delicious, rich sauce. The ascendance of crock pot cooking has boosted the popularity of the pot roast in recent years. Boasting everything a good pot roast should, there’s plenty of rich gravy, delicious vegetables, and melt in your mouth meat in this pot roast recipe featured on Cooking by the New York Times. This is the perfect Sunday dinner recipe for the whole family, especially on a crisp fall or winter day. If you’re not a master in the kitchen but still love food, then this is the recipe for you. This Beef Pot Roast Marsala from The Gourmand Mom has simple ingredients and won’t take forever to prepare. Your biggest challenge might be resisting the temptation to dig in while it’s still cooking! 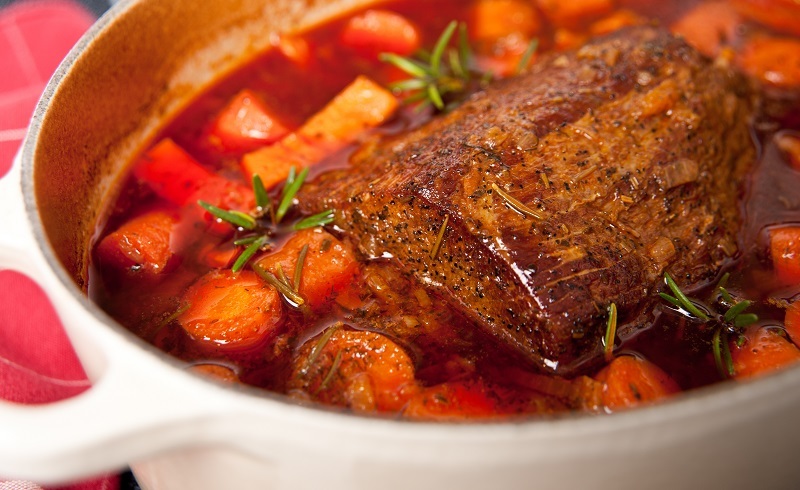 The perfect pot roast makes for a delightful Sunday dinner or midweek feast. Fried chicken has been a Southern staple for nearly 300 years, when African-American slaves started cooking a heavily seasoned, flavorful spin on a Scottish recipe. But you don’t have to be from the South to love fried chicken — every American should know how to cook a tasty batch of fried chicken. If classic fried chicken is your thing, then you can’t beat this super easy Buttermilk Fried Chicken recipe by The Seaman Mom. Chances are you have everything in your cupboard ready, and it won’t take long until you’re chowing down on this juicy, mouthwatering take on fried chicken. This sticky, sweet, saucy Honey Chipotle Chicken Crispers recipe by the Spicy Southern Kitchen is a yummy take on the original. For something completely different — and eminently delicious — try your hand at this crispy, spicy-sweet bar food delight. Just follow these simple recipes and you’ll be enjoying crisp, moist fried chicken. So now you have some truly epic recipes to salivate over, all you need to do is order your ingredients and get cooking! Order all your groceries from your favorite online stores, like Walmart, Door to Door Organics and more, via DubLi.com and get Cash Back on every purchase!